Sure to grab the prize for the cockiest day of the year, March 19 is National Poultry Day. If fowl jokes aren’t your fancy, spoiler warning, this entry might ruffle your feathers. With roots of Cockfighting found in Persia from nearly 6,000 years ago, it’s believed that domestication of birds began between 7,000 and 10,000 years ago. Somewhere along the line, the idea was had to not just pit the birds against each other in bouts of epic plumage, but to also consume them as an excellent source of protein. You might say someone decided just to wing it. But enough clucking around — let’s get into the meat of this most excellent day. Over 50 billion birds are raised each year worldwide for poultry and eggs. The FDA approves the usage of antibiotics for poultry farming. As World War II causes a shortage of beef and pork, chicken consumption soars. First mention of duck, turkey, and goose in agricultural texts. What better tribute to the first person in history to eat a domesticated bird than to prepare a feast? Poultry can be baked, fried, grilled, sauteed, roasted, braised, and even poached. The meat is delicious in nearly any setting, minus raw. The term poultry refers to chicken, turkey, ducks, geese, quail, and pheasant, but did you know Ostrich is also classified as poultry? While there probably isn't a grill big enough to plop an Ostrich on, their eggs are available for purchase at select grocery stores. Have a huge omelet for breakfast! Ah, the timeless mystery of why the chicken crossed the road. The question may never be answered, but is not the beauty of academics in the journey rather than the destination? Dare you go further, by asking why the duck crossed the road? (Because he's no chicken, obviously). Poultry contains less cholesterol than most cuts of red meat, fewer calories, and far less saturated fat. If that's not enough, a 100 gram serving of chicken breast has 31 grams of protein, edging out the 27 grams of protein in the same sized serving of skirt steak. Avoid red meat and keep feeling like a Spring Chicken! If you've been led astray by the rumors that dark meat is worse for you than white meat, keep reading. 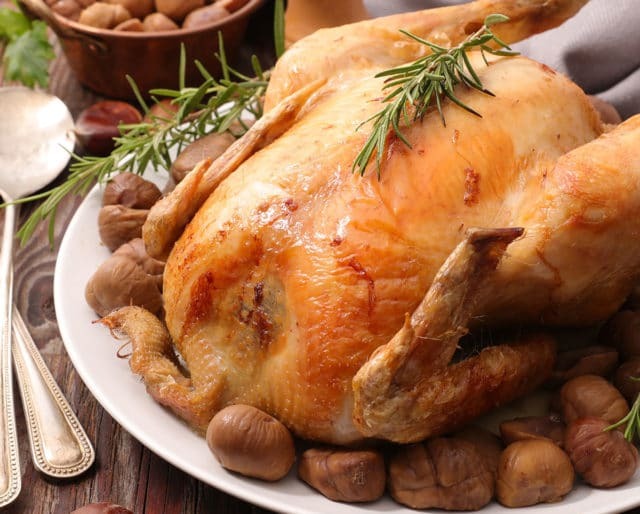 Dark meat has a few more calories and slightly more fat than its lighter counterpart but also contains more iron, zinc, riboflavin, thiamine, and vitamins B6 and B12. If you're feeling peckish, go for either. Not to egg you on, but the average rotisserie chicken at a grocery store costs less than $10 for two to four pounds of meat. It's not National Mathematics Day (that's technically December 22), but that adds up to a pretty darn good deal.